We've been teased for a few days now that puppies (and kittens) would be coming to CastleVille, and now we can finally stop all of that anxious waiting as puppies have officially arrived! It looks as though we won't have to choose between having a puppy or a kitten, as puppies are the only animals available (for now). You'll be able to adopt a baby via a set of eight new quests in the game called "Puppy Love." Check out how to finish them below. Notice that it just says "plant" Carrots. You don't actually have to wait an hour for them to grow. For finishing this quest, you'll receive 1,000 coins and 20 XP. Remember to summon a Gloom Wolf if you don't have one in your Kingdom (and don't bring one out when feeding the animals). You'll receive another 1,000 coins and 20 XP for completing this quest. A Parchment is crafted inside the Studio using four Wood and six Cotton each. You'll earn 1,500 coins and 30 XP for completing this quest. The Chicken Meat comes from feeding adult Chickens, but you might be lucky enough to already have them in your inventory. 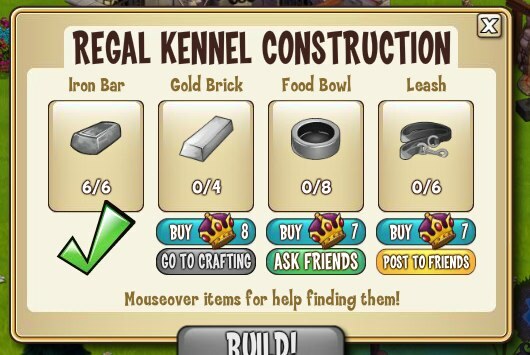 Meanwhile, the Large Trough costs 5 Reputation Hearts and the base of the Regal Kennel costs just 5,000 coins. You'll earn another 1,000 coins and 20 XP for completing this quest. This quest will be the first to actually make you pause, as you'll need to collect or craft plenty of items to actually complete the construction of the Regal Kennel. You'll need six Iron Bars, four Gold Bricks, eight Food Bowls and six Leashes. The Food Bowls are earned by sending out individual requests to friends, while the Leashes are earned via a general news post. Of course, you'll need to finish the construction of the Kennel before you can actually purchase a puppy, but when that's done you'll have three options: a Black Poodle for 45 Crowns, a Brown Puppy for 20,000 coins or a Yellow Lab for 50 Crowns. You can name your puppy and choose its gender before actually making a purchase. All of that out of the way, you'll receive 1,500 coins and 30 XP for completing this quest. To play with your Puppy, you'll simply need to click on it five times after you've given it its ball. As for the Dry Biscuits, these are earned by asking your friends to send them to you via a general news post. You'll receive 1,000 coins and 20 XP for completing this quest. The Chew Toys are crafted inside the Studio. When you've played with your Puppy enough times to make it happy (you will fill its happiness meter), you'll be able to go on a treasure hunt with it to finish this quest. You'll receive 1,000 coins and 20 XP in the process. With each Treasure Hunt you complete, you'll receive new crafting materials that can be used to create all sorts of items, like Dragon Blades (instantly banish Gloom Goblins), Dragon Soup (consume for 10 energy) and Black Tiles for your roads, among many others. You'll receive 1,000 coins and 20 XP for finishing this final quest in the series. 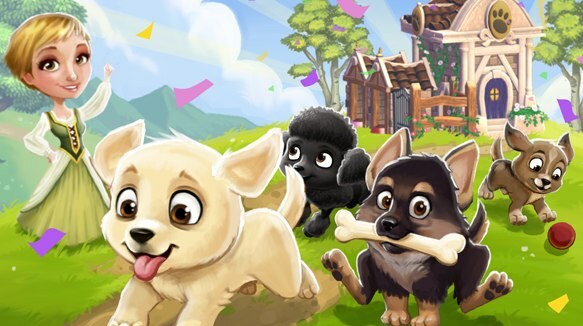 There are different puppy prizes that can be crafted in the Workshop, Kitchen and Studio, depending on whether or not you'd like to craft something that gives you energy, a decoration for your kingdom and so on. Most of the crafting requirements therein are items you'd also find elsewhere (Red Feathers, Rubies, etc. ), with the final materials being those that your puppies need to help you earn. It's unknown as of this writing what the kittens in CastleVille will do, or whether they'll even have an overall function at all, but we'll make sure to let you know as we learn more. In the meantime, make sure to work on adopting your very own Puppy in order to bring man's best friend to your kingdom! What do you think of these Puppy quests, or the ability to craft specific items with the help of our Puppy? Sound off in the comments.